Listening to the beat of the music reverberate off the hollow walls, I watch as people swivel and sway past me at high speeds with their bearings roaring and their metal plates clanking against the hard concrete. They aren't in a hurry to get anywhere considering the track moves in a circle. I know it's not about going fast or beating others to each corner. I know it's really about feeling the beat of the music and letting it affect your movement. Many people consider Jam Skating something that is stuck in the '70s, but really Jam Skating is very much alive for our generation. For those unfamiliar with this sport, it's basically incorporating different dance styles on skates. 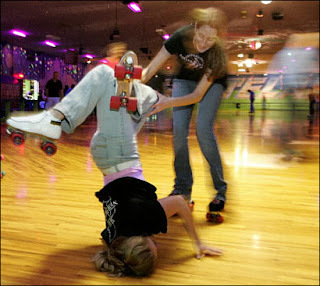 Some people describe it as break dancing on skates, but I don't see it that way. 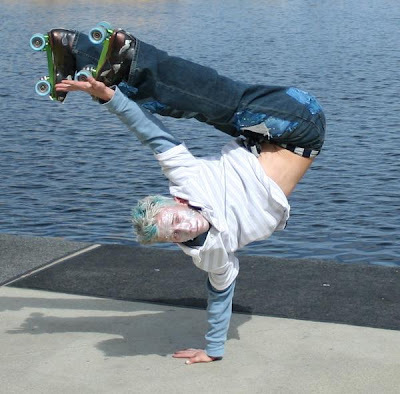 To compare it to break dancing would be impossible, because not only are you flipping and lifting yourself up with arms' strength, but you are also carrying extra weight on your feet, which is something break dancers certainly don't have to endure. My passion for this sport began when I was 8 years old. A few years after learning the basics and how to stand up, I picked up the art of "trucking" or jam skating. The term for the act isn't important, but for the sake of this blog let me clarify that it has been called many things. Some people refer to it as shuffle skating, shadow skating, bounce skating, rexing, crazy legging and roller disco. Even though it has many names and moves, jam skating only has one home and that's at the rink. Growing up, I watched as professional jam skaters formed groups and performed in the middle of the rink almost every night. It was amazing to watch how different individuals could come together to move as one. I knew I wanted to be able to do that someday. For anyone interested in learning how to jam skate, I would recommend going to your local skating rink and practicing. Once you feel comfortable circling the ring, you can go online to check out videos with beginner tutorials.